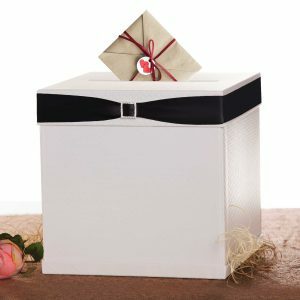 Merry Expressions Gift Card Box is perfect for any occasion! Weddings, Birthdays, Graduations, Showers. 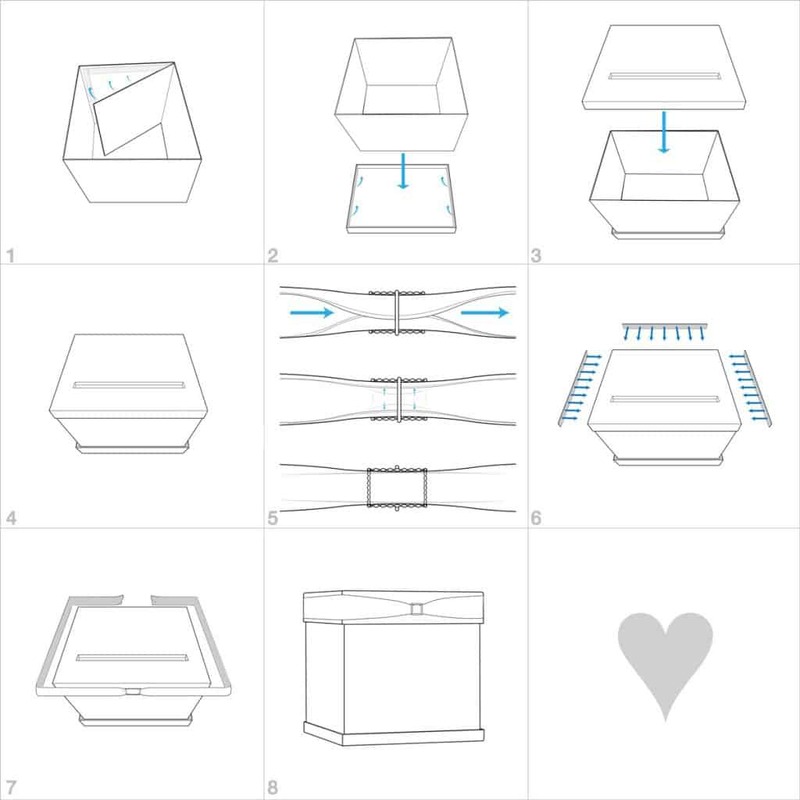 We spent a lot of time building and designing the perfect gift box. It’s built with the highest quality of reinforced cardboard and covered with beautiful textured glossy paper. 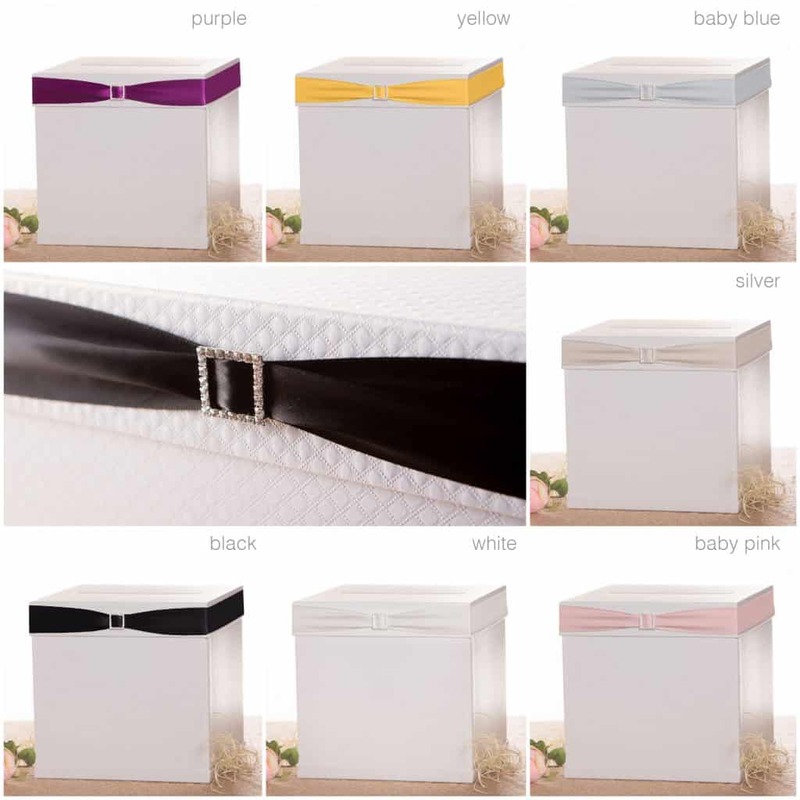 Classic Beauty & Style – These square gift boxes for men, women, couples and families feature a rhinestone buckle, textured glossy finish, and satin ribbon for an iconic look. A Beautiful Event Touch – Great as a wedding gift box or celebrating graduations, anniversary parties or baby showers, they keep cards and messages neatly organized. Embossed, Radiant Finish – A sophisticated gift box card holder, the white textured paper mimics fine fabric while the gorgeous ribbon adds a pop of stunning color. 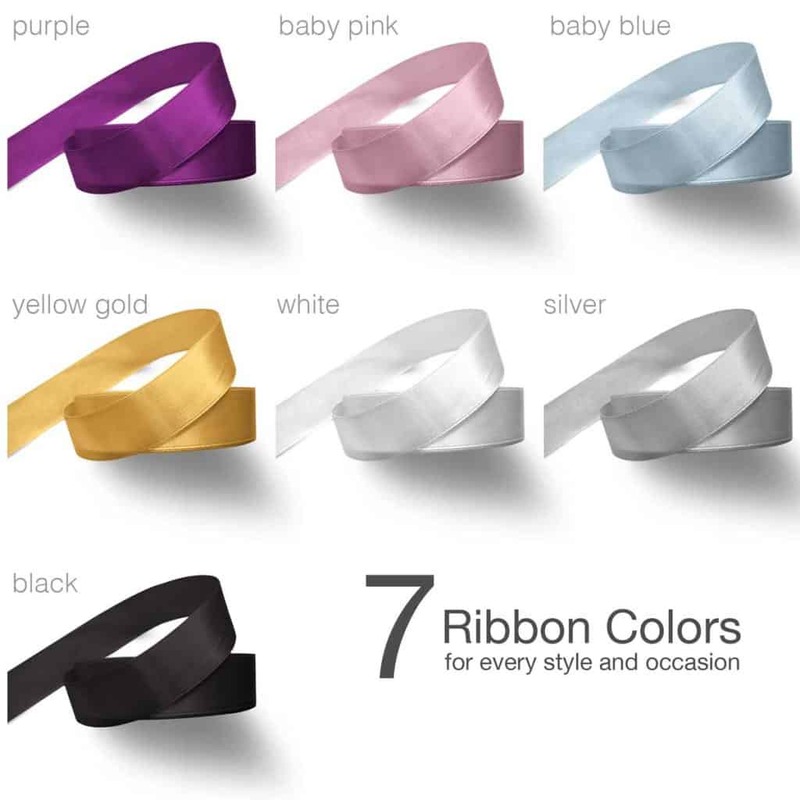 Multiple Ribbon Color Choices – Choose traditional white satin or match your event, wedding or party theme with baby pink, baby blue, yellow gold, purple, black or grey silver. Quick & Easy Assembly – Offering a strong, stable base and enhanced cardboard durability, the square shape secures with adhesive straps to eliminate gaps and is foldable reusable to enjoy with other special occasions. 100% Satisfaction Guarantee – Our company stands for love and joy. So if, for any reason, you don’t absolutely love your gift box, just return it, and we’ll refund every penny (or replace it, if there is a problem). Celebrate your special event with a premium gift card box that adds style, class and sophistication to your card-giving (and receiving) experience. Cards, messages, and love notes are a common theme among almost every party, personal event, and wedding; which means you need a smart and elegant way to keep them neatly organized until you’re ready to open them. 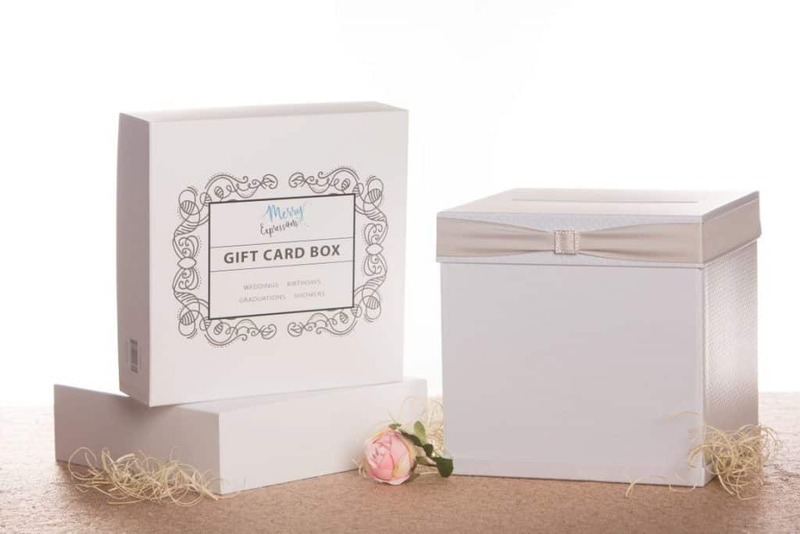 That’s why we created the Merry Expressions Gift Card Box, a classically-designed event box that allows guests to slip in their cards discretely and with personal care. These glossy, textured square boxes are just the right size for holding up to 150 total cards. What’s more, our gorgeous design features one of seven unique ribbons that add just the right touch of color as well as a small rhinestone buckle to add style to your event, gathering or celebration. They also make a wonderful keepsake or memory back to cherish memorable events! Not only do we provide beautifully elegant boxes perfect for weddings, birthdays, and special occasions, $1 from every product sold goes to supporting organizations that help fight illiteracy, child labor, and human trafficking. That’s because we care about making a positive difference in the world; and we want you to be able to help too! Assemble the sides of the box by folding the 5-fold panel so that the first and last panels overlap. Secure the overlapped sides with adhesive strips. Peel the adhesive strips found inside the base and place the sides of the box against and press firmly to secure. Slide the top lid over the open end of the 5-fold panels. Your box construction is now complete. Pick your ribbon and thread it through the buckle. Slide the buckle to the middle of the ribbon. Gently fold the edges of the ribbon on the backside of the buckle. Sliding the buckle right and left will make sure it’s evenly folded on both sides. Peel one side of the adhesive strips and attach it along the sides and back of the lid. Make sure the strips are aligned and press firmly to secure. Position the buckle to the center of the front side of the box. Pull the ribbon around the box and over the adhesive tape. Press firmly. That’s it. Your gift box is now ready. Get this high-quality, all-purpose gift box and show someone you care about how much they mean to you in classic, unforgettable style.